In the era of the narcissist selfie it is both urgent and necessary to reflect on the nature of Ego, on how it influences and affects our existence. As stated by Alejandro Jodorowski: “The ego is a cage with no bird that believes it’s a bird with no cage”. Surface and appearance become the system and rules that drive our actions. Egotism permeates political and social life and egos grow as strong, unsustainable and destructive entities that benefit neither the individual nor the collective. Ideologies, propaganda, seductive corporate messages, hyper-productivity and the astute architecture of capitalism, compose the elements of that cage whichoppresses the essence and enhances the ego. Kaja Silverman, a psychoanalytic theorist who has studied the links between the ego, the gaze, the look and image, considers Lacan and Freud's well-known perspective on the ego: “Lacan proposes that the ego comes into existence the moment when the infant subject first apprehends the image of its body within a reflective surface, and is itself a mental refraction of that image. Thus, the ego is the representation of a corporal representation”. She also underlines: “In The Ego and the Id, Freud maintains that the ego is ‘first and foremost, a bodily ego; it is not merely a surface entity, but is itself the projection of a surface’”. The transient passage of life, the concept of impermanence, the Buddhist Anicca, the Fanaa vision in Sufism, the Hindu concept of Samadhi, the Pali term Nekkhamma, the active nihilism of Nietzsche’s philosophy, Heidegger’s Mitsein or Vattimo's ‘weak thought’, all deal – in one way or another – with the idea of renouncing and disappearing. 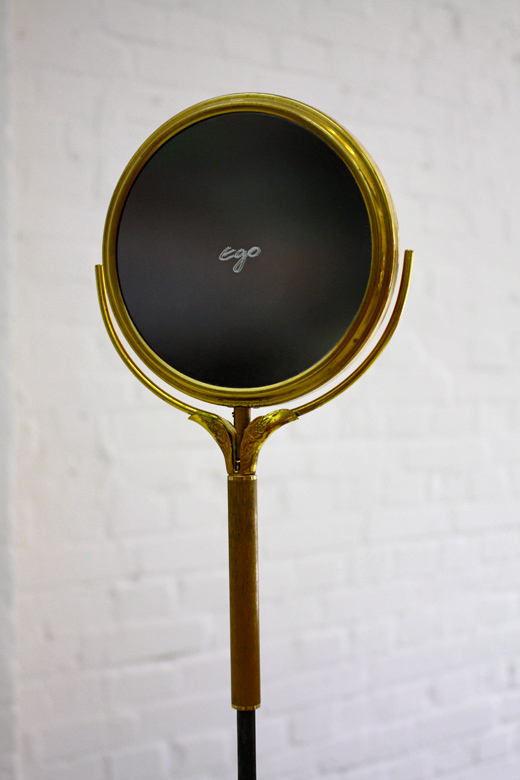 Thilo Droste, with his work Self Portrait, provokes our narcissistic nature by engraving the word ‘ego’ onto magnifying mirrors. Our enlarged reflected images directly confront the notion of ego, thus triggering thoughts on the state of our own projection, representation and essence. In humanistic confession manual, an elegant mirror reflects the engraved sentence ‘Ego Te Absolvo’ — the Latin formula of the Christian absolution — which, in this case, may refer both to the tendency to absolve the sins of the ego, as well as to the cages represented by ideologies or religious superstructures. Kimsooja, An Album: Havana, 2007, still from single-channel video projection, 6:57, loop, silent, Courtesy of Galeria La Fabrica, Madrid, Kewenig Gallery, Berlin and Majorca, and Kimsooja Studio. In Kimsooja’s An Album: Havana, we contemplate a silent passage, a travelling sequence, a visual reflection on how life and bodies will — sooner or later — become dust and light. The video and the prints speak of disappearance; they suggest a poetic representation of our passage from the tangible to the intangible, from the figurative to the abstract, and remind us of our quick passage on this planet. Rhodopia, by Christoph Schwarz, is a personal story that describes – through an ironic approach – the artist’s efforts to make his life anew. A self-reflection on the sense of his life – caught in-between artist residencies, work and daily routines – in search of a new identity and other possible layers of existence. Jordi Tolosa, with his installation I will never die, on the one hand, makes a strong statement revealing the powerful presence of the “I” beyond any other spatio-temporal manifestation; on the other, given the movable and flexible nature of the installation, the sentence becomes deliberately ambiguous. In the delicate installation I and my eternity, three different iron frames – the ‘I’, the conjunction ‘and’, then ‘my eternity’ – stand solid on the ground, referring to the inner world of the artist, while giving space to otherness, combination and difference as well as to the profound, abstract, infinite and mysterious concept of eternity. Toni Serra *) Abu Ali's Satsanga is a video deriving from a conversation recorded in the 70s in Mumbai (India), between a traveller and the Indian philosopher Sri Nisargadatta Maharaj, author of “I am That”, one of the most recent and significant exemplars of Advaita Vedanta. The centrality of consciousness surrounded by maya (illusion), the abandonment of personal identity, the possibility of renunciation and vanishing and the identification with the body as an impediment to self-realisation are some of the main concepts emerging from the video. The interactive work I DO, developed by Jakob and Manila Bartnik, is focused on the idea of “renouncing”. Asking people to engage in a “not doing experience”, opens a different space – in terms of thinking and acting – that we are not used to anymore. The I DOexperience deviates the normal daily course of life through the paradoxical application of limitations and restrictions. The project consists in several steps, including a final meeting where the participants share their own personal experience of renunciation. IGG, a series of portraits produced by Michael Wesely, reminds us that we do exist in connection with others. The overlapping of images suggests the idea of the Onethat connects to the Multiple; the individual who gains another significance upon merging with the collective. Wesely's photographs open up a reflection on the Mitsein, on the idea of being-with-others, on concepts of group-individuality and group-dynamics. In the video Prevision I, by Susanne Bosch, a naked body faces an empty theatre. The almost static image becomes a metaphor of the self facing the theatre of life – empty, but full of possibilities – with a voice-over that remarks the stages –past, present and future– of life: I remember, I care, I wish. The video-projection I can. You can, by Marko Schiefelbein addresses the manipulation of the self – and the construction of the ego – through advertising and multinational corporate messages. The piece presents a calm monologue, a world of thoughts and ideas, a set of mantras, that should alarm us and make us aware of the powerful superstructures and systems surrounding us and becoming our cages, finally oppressing the self, the essence and free thought. The Reflection Room, a secular chapel conceived by Antoni Tàpies for the Pompeu Fabra University, is a 500m3 space dedicated to silence and contemplation. As expressed by the artist: “Given the excessive turmoil, mental distraction and the innumerable cults to “false realities” to which we are subjected in today’s societies, I saw an excellent opportunity to contribute to creating an area and some images that help with meditation, concentration and, in short, a better understanding of our true being”. A silent space that is certainly appropriate for deepening a reflection on the concept of ‘Minus Ego’ and the related ideas of renouncing, disappearing and sharing. The exhibition Minus Ego previewed at the Transart Triennale at Ufer Studios in Berlin in August 2016; and was fully shown at Goethe-Institut Barcelona from October 7, 2016 to January 27, 2017.